It is very important to protect your home and business from termite damage. In fact, termites cost the country over $2 Billion dollars a year in property damage.Owing to their wood-eating habits, many termite species can do great damage to unprotected buildings and other wooden structures. Their habit of remaining concealed often results in their presence being undetected until the wooden structure is severely damaged, leaving a thin layer of a wall that protects them from the environment. Damage from termites can range from minor, superficial damage to major structural damage that can cause ceilings or floors to collapse. Early detection of termite infestations is crucial to minimize the risk and cost of repairing termite damage. Annual inspections by a trained termite professional can help you detect signs of activity, some of which may not be easily visible. Termites are eusocial insects that are classified at the taxonomic rank of infraorder Isoptera. Termites are among the most successful groups of insects on Earth, colonizing most landmasses except for Antarctica. Their colonies range in size from a few hundred individuals to enormous societies with several million individuals. Termite queens have the longest lifespan of any insect in the world, with some queens reportedly living up to 30 to 50 years. Colonies are described as superorganisms because the termites form part of a self-regulating entity: the colony itself. The colonies are separated between a caste system, typically a hierarchy of queen, swarmers, workers, and soldiers. The workers feed the colony and do all the nest building. There can be ten to hundreds of thousands workers in a single termite colony. They do the majority of damage to property, and a large colony can do so in a short span of time. Soldiers protect the nest from predators, especially ants. Some soldiers and give a painful bite due to their large mandibles. Swarmers are winged termites that scout for new locations for the colony to make a brood in. If you see these you should be alarmed, because they might have chosen your property as a potential new home. Queens are very large. Their abdomen is large compared to the rest of the body due to the sheer amount of eggs it holds. The queen only lays 10–20 eggs in the very early stages of the colony, but lays as many as 1,000 a day when the colony is several years old. At maturity, a primary queen has a great capacity to lay eggs. The abdomen increases the queen's body length to several times more than before. A house with damage from termites often looks the same as any other house on the surface. 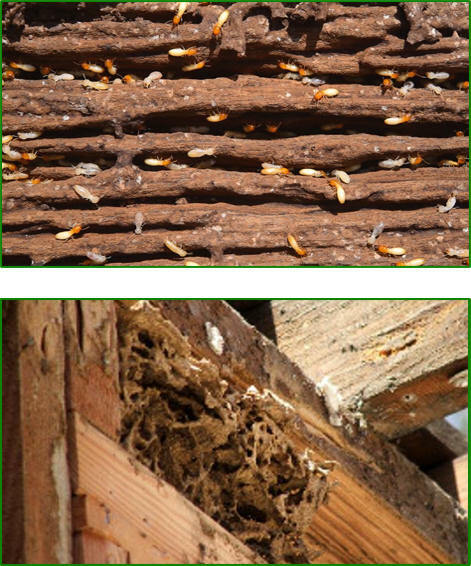 Termites can build nests hidden inside walls, causing damage for years before it becomes apparent. Envirotrols Termite Technicians are trained to spot signs of termite activity, potentially before the colony has damaged the wood inside a home. INSPECTION: Initial inspections determine the extent of infestation and the best approach for long-term control. Annual inspections are necessary to diagnose future infestations. Envirotrols’ Termite Specialists are trained to spot signs of termite activity, potentially before the colony has had time to significantly damage the wood inside your home. TREATMENT: The Envirotrols’ Termite Control Program uses Termidor as its primary termite treatment product.Envirotrol Pest Management is a certified Termidor partner. Termidor has a proven track record in termite control having been used to protect over four million homes since its introduction. Because it is undetectable, termites don’t even know what hit them. This is an important advantage because it helps prevent termites from spreading. If you have any concerns about termites in your home or business. If give us a call or navigate here for a free bid.